Chemical-biological research from the University of Copenhagen sheds light on important communication processes in the brain by means of new effective molecules that improve the starting point provided by nature by more than 1,000 times. In the long term, this new knowledge may lead to psychopharmacological drugs with fewer side effects. The results have just been published in the recognised journals Nature Communications and Angewandte Chemie. Proteins play a fundamental role in almost all biological processes. They consist of chains composed of up to 20 different amino acids, and their composition, structure and function are controlled by the genetic code. Brilliant minds at the Center for Biopharmaceuticals are now attempting to rewrite the core function of proteins by making alterations in their molecular composition, for example. By means of advanced chemical-biological techniques, researchers are capable of designing new chemical compounds that overcome nature’s limitations. The capacity to manipulate proteins has led to important breakthroughs in biotechnology and biomedicine. – The capacity to manipulate proteins has led to important breakthroughs in biotechnology and biomedicine. We have, among other things, studied the so-called GABA receptors which are important targets for drugs for the treatment of mental disorders, e.g. benzodiazepines for the treatment of anxiety and insomnia. 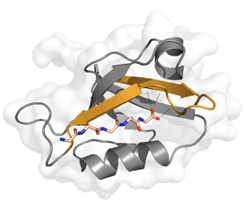 We have, more specifically, studied the receptors’ interaction with the protein gephyrin. Not only to learn more, at a structural level, about a key interaction in the brain, but also to see whether we could turn it up or down. We have very successfully achieved the latter – we can document an inhibition, which, at best, is more than 1,000 times stronger than what is seen in nature, says Postdoc Hans Maric. He is part of the Center for Biopharmaceuticals at the University of Copenhagen, which is headed by Professor Kristian Strømgaard. The new research findings have just been published in Nature Communications and Angewandte Chemie. The first article describes the initial work with mapping glycine and GABA receptors, respectively, and how the two receptor types interact differently with gephyrin. 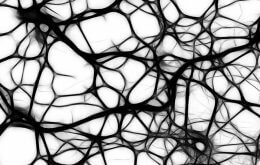 The other article describes the molecular restructuring that has created a neuro-active peptide that is 1,000 times more powerful that what nature offers.